What is an EPC page 2? This section looks at each element of the property that is investigated as part of the EPC survey process. Element: Lists the element of the property in question. Description: Describes the element in question. It is worth noting that when producing the report the assessor selects the details of each element from a list on the government software that produces the report. As this list is necessarily finite some more unusual construction techniques may not be listed. In these cases the listed element that has the closest thermal performance to the actual element will be selected. If you are unsure about anything listed here, or elsewhere on the EPC, please do not hesitate to get in touch for clarification. Energy Efficiency: Gives the element in question a star rating, with 5 stars being the most efficient and 0 stars the least. It is worth noting that the ‘Floor’ element, and if present any 'Secondary Heating' are not given a star rating. Low and zero carbon energy sources suggest the best measure the property can take for producing energy with low or zero carbon missions. 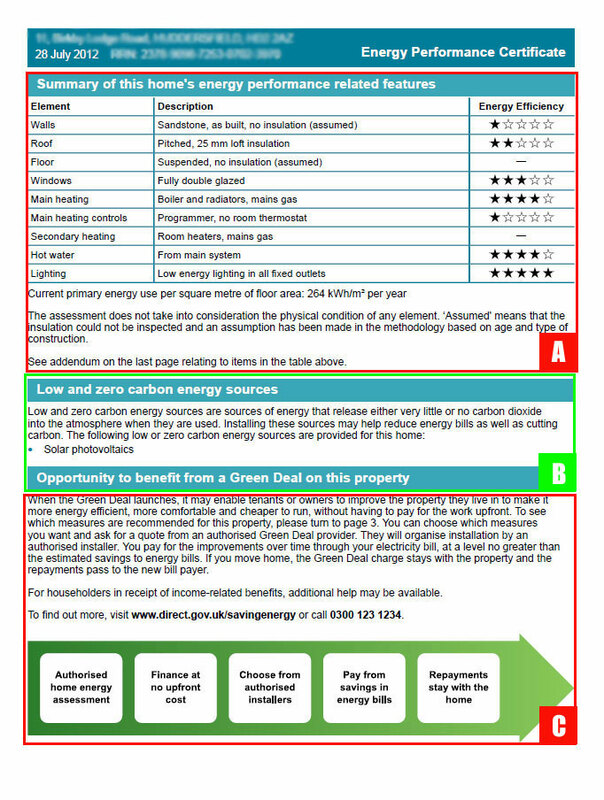 This section explains the workings of the Green Deal. This innovative financing mechanism lets householders install measures to improve the EPC rating of their property at no upfront cost to themselves. Easy EPC can help you with all your Green Deal needs.